Belgravia, London. Caroline Terrace, Grade 11 Listed House, Freehold, with garden. 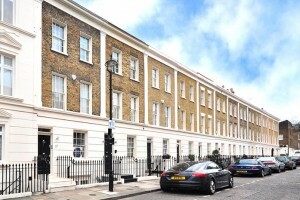 London Belgravia Grade 11 Listed building Freehold. Laid out over 4 floors the accommodation, which would further benefit from some modernization, includes a first floor reception room, generous kitchen/breakfast room and two double bedrooms both with en-suite bathrooms. In addition there is a good-sized garden.